Well, I have to be honest with ya'll. I don't garden. I don't mow the grass, keep a garden, grow stuff, or pull weeds. I think I was scarred for life as a kid. We lived on a big corner lot when I was a teenager. One summer, my dad made me pull all the weeds in the whole yard before I was allowed to do anything with any of my friends that summer (and I wasn't even being punished for anything, that's just what kind of torture he made up especially for me). Being that the yard was so big, by the time I'd finish with one side, the other would be full of weeds again. People would actually drive by our house and literally ask me if I ever stopped pulling weeds. Ever. Needless to say, I went nowhere that summer, except to my little towel to sit on in the front yard for more endless (useless) pulling. Man, I wish they had iPods back then. Anyway, even though gardening and yardwork aren't my thing, I fell in love with this little cutie the minute I laid my eyes on her! 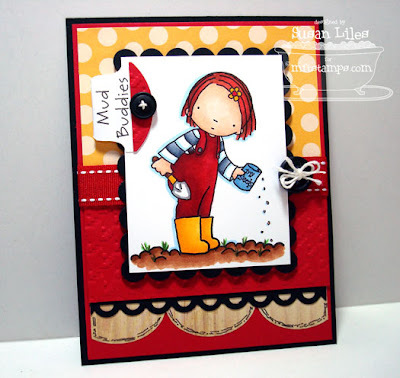 She's a NEW Pure Innocence girl from My Favorite Things called Mud Buddies and I get to give a little sneak peek of her today, but the stamp set will be available for purchase after the Release Party this Wednesday night. I love her RED hair! 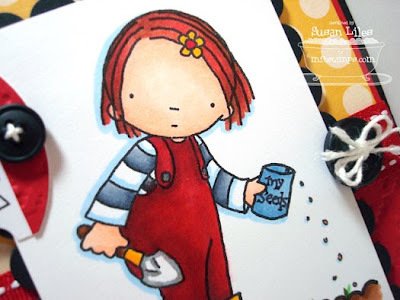 Another little touch I gave to this stamped image is on the little seed packet. I guess it could be a can of something she's pouring, but I took a Microfine Pen from Prismacolor (so it wouldn't bleed into my Copic coloring) and wrote, "My Seeds" on the front, making it an envelope full of seeds. Yes, this is the way I plant things (if I even bother). Just sprinkle the seeds on top of the ground and give them a little water. If they take, great, if not, some bird just got lucky. Don't dare get those boots dirty, either. Ok, so I know ya'll are dying to see more teasers! All of the new Pure Innocence stamps are being shown today be several members of the MFT Team. Go see what they've cultivated by checking out all the links on Kim's blog HERE. SUSIE Q-TIP: Remember that file tab punch you just had to have, but that now lives in the back of your punch drawer? Use it. So cute!!! LOL @ pulling weeds! I'm totally opposite of you, I do ALL the yard work since my husband has allergies(lucky guy, eh?) ha! This PI girl is adorable and going to be a must have for me! Cute Susan! Love her red hair too! And I love the way you doodled on the scallops! How cute!! This is a fabulous card! Okay, okay, I'll try to use that file tab! :) I love the apron lace paired with the scalloped dienamic. Very cool! Susan, I love this card! She looks great as a red head! I love your papers too! Just gorgeous! This is so stinkin' CUTE, Susan! Love the red hair and your dirt--fabulous! I remember those days...those ones before you could buy a bag of weed killer! Cute card. Sorry about the weed patch growing up. I tried planting a flower garden and killed it and only one weed will grow now. Must have done a good job killing the flowers. This little girl is too cute and I loved your Susie Q-Tip. I had to laugh at that one. I have that punch collecting dust. So cute Susan. I love those rich colors! Awwwww, cute as can be! Love that red hair! Love the story, Sus...'cept I sure wish I coulda been there helpin' you pull those weeds! I always stuck at home cookin', cleanin' and washin' the laundry...no wonder I was such a rebel...still am I guess. Oh, btw, your garden girl is just as sweet as can be...love those bold colors! And...love that fancy SFYTT card I spied below...gorgeous! This is just too cute!! Love it!! I am sorry about the weeds, though!! Totally adorable card! Great colouring. I remember weeding a huge garden bed myself LOL! Still mow and weed now too as hubby does most of the cooking. PRECIOUS! Love this card and she is a cutie, for sure. Great.